Play Guitar Now - Master the Mighty Axe! Be a "Jukebox Hero" - Play Guitar Today! Welcome, Rock Star! You got bitten by the bug, and you got it bad - you gotta play guitar! That 6-string axe feels like you were born with it in your hands. You spend all your spare time playing guitar, and when you're busy doing other stuff (like that 9-5 thing), you're thinking about playing guitar. Your main squeeze thinks you're having an affair, 'cause you're always holed up with that "damn guitar". Heck, my wife was telling someone just the other day, "All he needs is his computer and his guitar, and he's happy." OK, maybe you don't have it that bad. Maybe you're just getting started. You want to play guitar, but don't want to spend years taking lessons before you can jam to your favorite songs. Or maybe you just dusted off your trusty (and hopefully not rusty) axe and want to polish up your skills so you can start or join a rock band. You want to re-learn some songs so you don't look like a total n00b at your first practice session or audition. That's what I'm talkin' about here - giving you access to good, solid rock guitar instruction so you can play guitar with the best of them. I'm hunting down the best rock videos, audios, tabs and anything else that makes it easy to play guitar. It's the ongoing mission of the "Midlife Rocker" (that's me!) to find, learn, teach, and guide you to the juiciest guitar licks, riffs and chords out there. This is your "one-stop-rock-shop" for finding what you need to learn to play guitar. We'll rock out to heavy metal and punk, classic rock and alt, shred and grunge. There's something here for every rock guitar player. We'll talk about easy, beginner stuff to get you started. Whether you can play guitar "by ear" or need tabs and sheet music, it'll be here. Chords and scales? Yup! Rock hardware - guitars and amps, effects and pedals, practice and gigging gear. Then we'll get into the tricks and techniques for rhythm and lead playing. The resources to "step-it-up" are here for you to dig into and master. You'll be ready to "rock out" in no time. You'll want the heads up on new guitar-ific information being added to the site, so subscribe to the Play Rock Guitar Blog using the RSS feed links to the right. Click here to learn more about it. I'm no pro - just a guy that got sick of living day-to-day without having any fun. Get up, go to work, come home, go to bed… Come on, there's more to life than that! 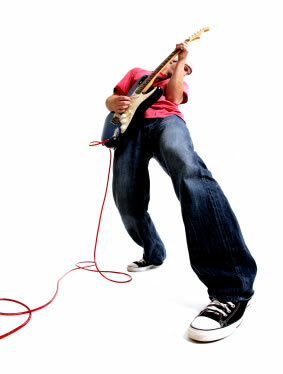 Playing guitar is an awesome release, a creative outlet and hey, it's just plain cool! People sit up and take notice when you can pick up your axe and play their favorite tunes. It just takes a little focus and some work. Stick around and you'll soon be able to take some of those rock star dreams and begin making them come true. Take a minute now and subscribe to the "Learn To Play Rock Guitar" Newsletter. Each month or so I'll send you new beginner rock guitar lessons and info to help you reach your "rock star" goals. When you sign up, you'll get immediate access to my FREE printable chord charts to download. So put down "Guitar Hero", pick up your axe, and let's get busy learning how to play guitar. Are you ready to go? Rock on, let's start to play guitar!